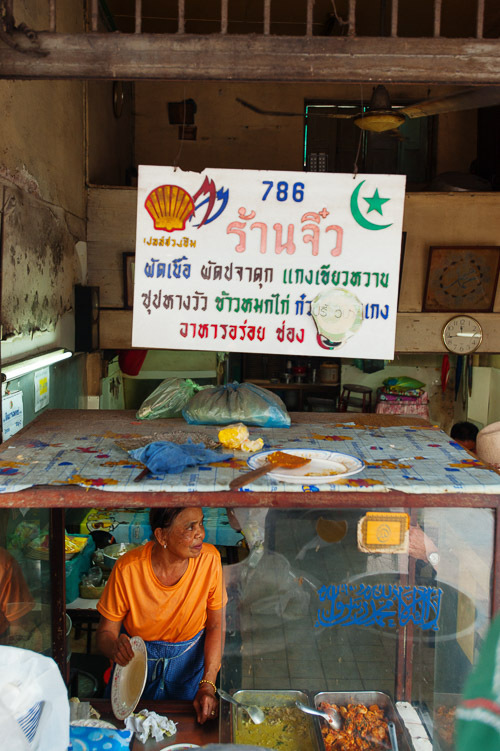 For Muslim food in Bangkok, one of the best areas is lower Th Charoen Krung. Formerly Bangkok's foreign enclave, today the European-run shipping offices and the Portuguese Catholic community that used to border the Chao Phraya River are long gone. 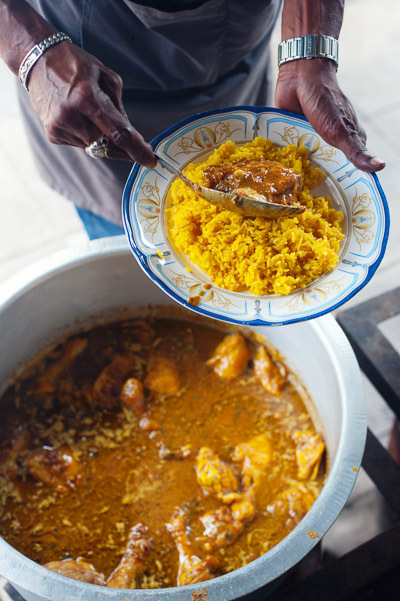 But much of the area's Muslim community remains, including -- thankfully for us -- its food. Open for 55 years now, Jiw is known for its khao mok kai (ข้าวหมกไก่) chicken biryani, probably the most ubiquitous and lauded Thai-Muslim dish. Yet the version sold here has little in common with the light, typically sweet street stall staple. 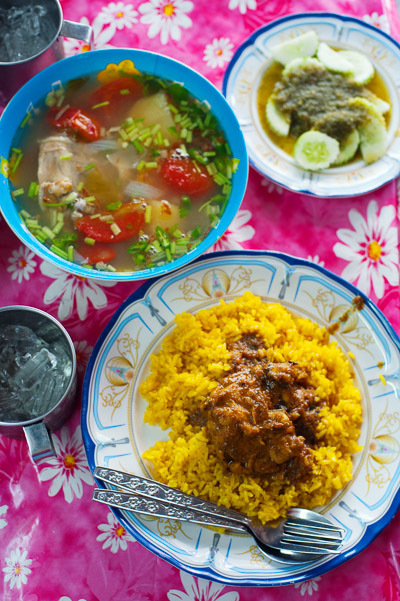 Instead, the khao mok kai here is more similar to the Bangladeshi-style version of the dish: relatively heavy and hearty, with short, dense grains of rice and little of the fluffy consistency many westerners tend to associate with rice. The result is hearty, mild and fragrant. My dining companion, Ung-Aang Talay, who estimates that he last ate at Jiw in 1987 (! ), claimed that, despite the passing of decades and the death of the original owner, the flavours of the dish had not changed. the latter, well-balanced and not as assertively sour as elsewhere, with lots of tender, tart tomatoes and even some chunks of potato. a dish that one doesn't encounter too often these days, particularly at Muslim restaurants. The catfish is tender, meaty and clean-tasting, and the curry paste -- still made in house following the original owner's recipe -- is an almost perfect balance of spicy and herbal flavours. 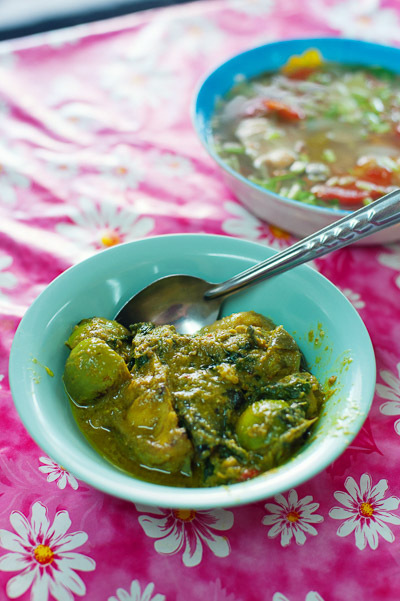 The dish has a pleasantly oily consistency, and includes a few crunchy eggplants and some torn Thai basil. By Thai standards, it's a relatively simple dish, but like the best Thai cooking, one that encompasses a seemingly disproportionate array of flavours and textures. Note that Jiw's closing time of 1pm is deceptive; although the restaurant only has three tables, it does a brisk business in take-out orders, and most of the dishes are already sold-out by noon (often earlier for the catfish).